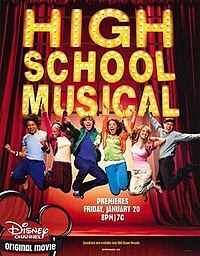 Plot: High School Musical is a story of two high school students, Troy Bolton (Zac Efron), who is captain of his school’s basketball team, and Gabriella Montez (Vanessa Anne Hudgens), a shy transfer student who excels in math and science. Together, they try out for the lead parts in their high school musical. Despite other students’ attempts to thwart their dreams, Troy and Gabriella persist and inspire others along the way. I heard of this made for tv Disney film from my friend tinkerbell when we were browsing for DVDs just before the holidays. Apparently her children loved it and kept raving about it and I unwittingly added it to my DVD rental queue only knowing that Disney produced it and I was glad I did. I later find out that it was made by director/choreographer by Kenny Ortega, the same guy who also made Disney’s 1992 film Newsies (starring a young Christian Bale) which I also loved. The songs and choreography were great and it’s safe to say that this can possibly be this generation’s Grease. I felt weird enjoying it but its always refreshing to see new material and fresh talent. You probably guessed it, but a sequel is now underway. Now, if only I had tv and I had cable. Youre right! It really was cheesy. this was a really good movie! !